Perhaps overshadowed by yesterday's MacBook Air announcement is Apple's big move into movie rentals. The fact that all the majors have joined the on-line offering makes it a compelling service to say the least. That is, if it's as easy to use as they say. Is it? Read on for the first hands-on. Update: Discovered something interesting about the aspect ratio... hint: it's not 16:9. So here we have the new Movie rentals section in iTunes. By our count, 150 films are available to rent at the moment. We'll chalk that up to the initial ramp up with an expectation of a far beefier catalog in the hours and days ahead. Hey, where's the HD version Steve-o was showing off during the keynote? 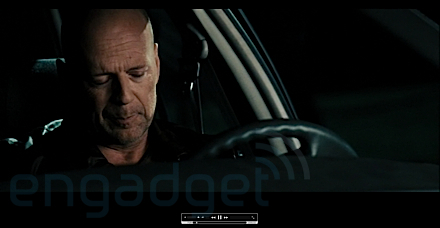 Oh right, HD flicks are only available when rented from Apple TV. What a gyp. 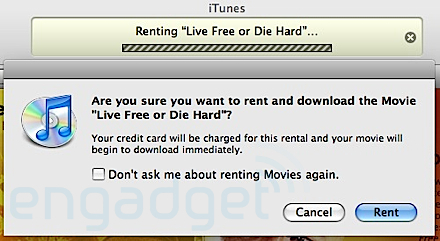 Ah well, clicking "Rent Movie" anyway to see what we get for our $3.99 new release. Yippee Ki-aye muther... we love debt! Done. But not really. Nothing happens. No download, no activity, just back to a blank page. Huh? Let's go back and click "Rent Movie" again. After that hiccup, we're back in action. 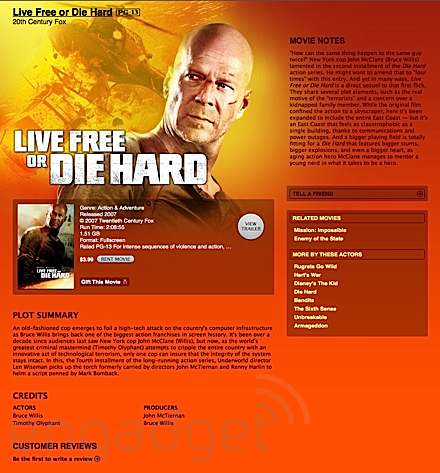 The movie has been added to the Downloads queue. After 3 minutes and 100MB of data transfered to our disk we're prompted with an option to start watching the film. Let's do it. Uh, we hear the audio but there's no film. What the hell? Did we just burn lunch money for audio? After fumbling around looking for the video in Spaces and Expose, we found it. Where? In that little corner window of iTunes. 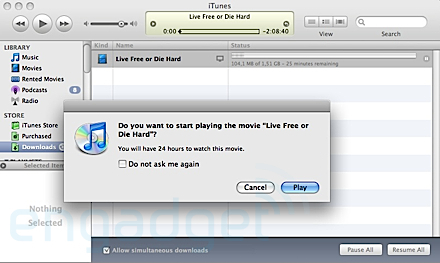 Obvious if you use iTunes regularly for video, not so for the vast majority of people who will be trying this for the first time. 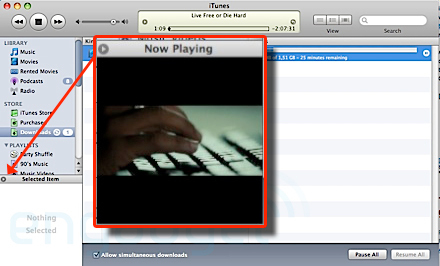 A click on the arrow will eventually bring up the Now Playing window. Click the Now Playing window to expand. Ah... full screen on a 30-inch, 2560 x 1600 pixel LCD display. Honestly, it looks and sounds surprisingly good. Certainly better than we had expected. 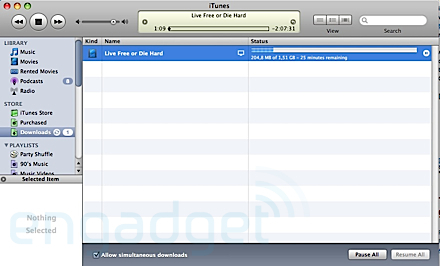 The download continues. 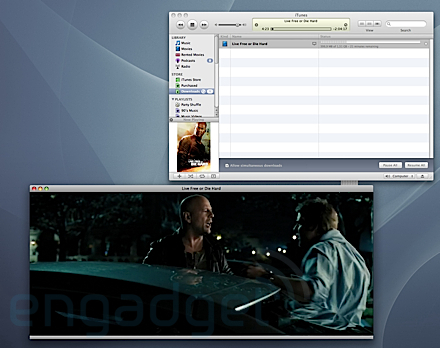 Video playback remains smooth throughout. 30 minutes later, the 1.5GB file is down over our 10Mbps DSL pipe. 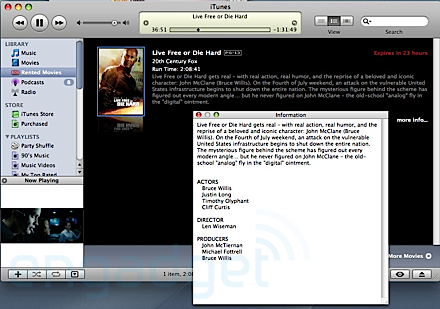 A new "Rented Movies" directory shows up in our iTunes library. Clicking "More Info" gives you some more information about your rental. The expiration time appears in the upper-right corner. 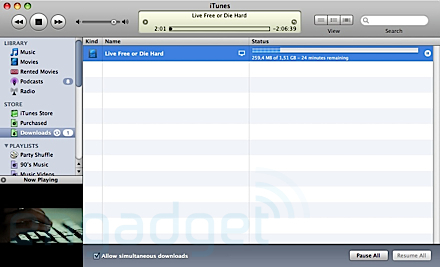 The 24-hour viewing clock is already ticking since we started watching the film during download. Really, who can wait the 30 day maximum before watching a film they just rented? 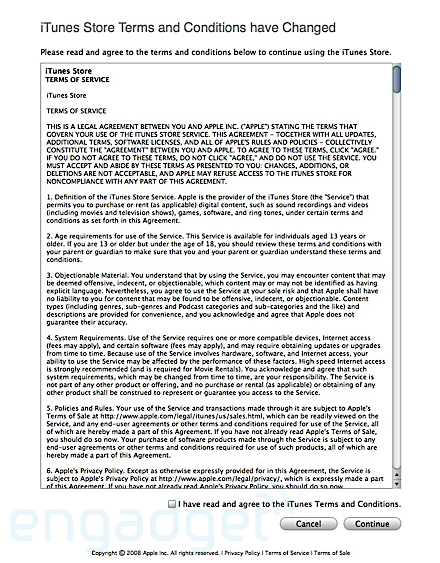 Don't worry, Apple is happy to nag you about your rentals. Damn, have to run out. Let's try to transfer the rental to our iPod like Steve showed us during the keynote. 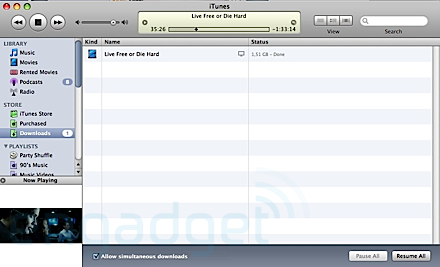 iPod plugged in, ready to sync and... er, what's this? How come our Video tab looks nothing like Steve's? Oh right, the rental transfers to iPods are for current generation "iPod classic, iPod nano with video and iPod touch models" only. Where's the firmware love Apple? Our iPod is only one generation old! After locating the file on our hard drive (~/Music/iTunes/iTunes Music/Movies) we discover some interesting details about our download. So what aspect ratio is 853 x 356 pixel exactly? 16:9, 4:3, or some iphone proprietary ratio sitting in between? None of the above. It's actually a cinematic 2.39:1. So yeah, we rented a second flick -- Zoolander. Note the variation in pixel density which also results in a 2.35:1 aspect ratio. 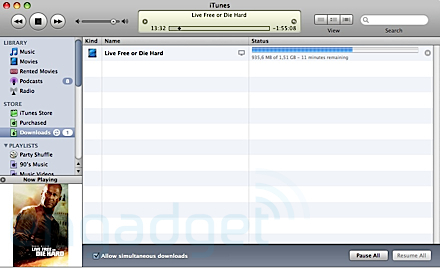 Looks like iTunes renters are in for a crapshoot. 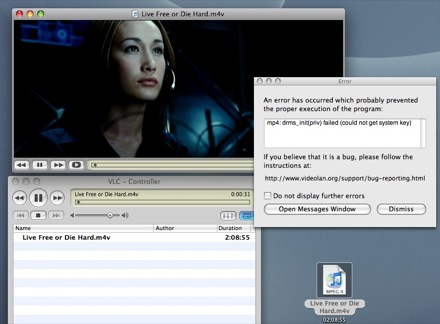 Oh, and in case you're wondering, yes we tried to open the file with VLC and other media players. No luck, the file is locked down tight with Apple's own flavor of special DRM sauce. You can see a few individual frames of the film but no video. 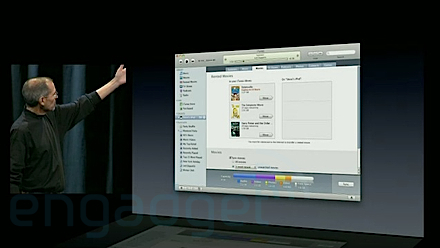 iTunes is the only capable player. Despite the few quirks we experienced, the steps required to rent from iTunes were dead simple and the ability to play the movie after just a few minutes of clicking "rent movie" was a big plus for our Type A personalities. Assuming you have the bandwidth that is. Sure, we're not talking HD video or 5.1 audio here. Nevertheless, the quality was surprisingly good when displayed full-screen on our 30-inch, 2560 x 1600 pixel display -- even when sitting at keyboard-length from the monitor. Perhaps the most telling result of our experience is this: we're tempted to rent again, soon.